He says in frustration, "I never SAID that!" She answers in deeper frustration, "You don't HAVE to." "Being inside the church we are probably as well aware of her faults as any person on the outside could possibly be. And we believe in her nevertheless wherever she manifests herself in a world of darkness and unbelief." -A.W. Tozer I have been thinking on the reality I don't really need to have people on the outside tell me about the faults with the church. I go there, ya know? I am on the inside. I know her faults more than you could even imagine. Here's the difference. I believe in her. I love her, and while I know and am frustrated with her faults, I also see her going into dark and broken places. While each congregation has their ongoing faults to deal with as a community, it is all worth enduring as long as the Body of Christ continues to advance in to dark places of the world. We need to deal with the weaknesses and the faults along the way, but don't give up meeting together as some are in the habit of doing. All who are in Christ are in Christ together. We truly are connected in all the greatest ways because of the gospel. The Body of Christ has been preached for centuries, but something I do not recall hearing about the body and its parts, which we are, is what happens when they are severed from the body. The Body of Christ only grows when it is held together. When it is disconnected parts, those parts die and cannot continue forward. Stay close and connected to the gospel and to the Body of Christ. Over and over again I watch people disconnect themselves from the Body of Christ and attempt to go it alone. With the fervor of Hebrews 10, I say, "DO NOT give up meeting together as some are in the habit of doing. " I have told people more times than I care to count: if you attempt to grow and move on your own, you will fail. If we play out the realities of a Body, not only will you fail, your will likely die. We most often are moving and going so frantically that God’s peace and blessing cannot land upon us. If God’s peace descends like a dove, I am all but swatting it away with my hectic grasping after success as defined by the American Church Dream. My priority is to be concentrated on Abba. His closeness is my ultimate good, and not my success as is demanded of me. I spend too much of my heart, mind, energy, and time comparing myself to others. Abba, I need you. I need you to be close to my heart and mind. I need your peace if I can just sit still long enough that it might descend upon me. There was a time in the not so distant past when disbelief was the great adventurous rebellion. It was a time when everyone said they were Christians and believed in God because any decent person would, which meant the real zealous ones were those who would actually deny God and the ability to experience such a God. There as a time that we are seeing the peak of now when there was a sense of being nearly heroic to refuse participation in 'organized religion' or 'the institution of the Church' or in being faithful in any form. I keep saying 'there was a time' because this is no longer the case. It no longer takes courage to disbelieve or deny or refuse a life of faith or participation in a faith community. Is this good news? I think so. The only rebellion left is to live a life pursuing holiness. The only remaining adventurous way of life is one of Christian community. A life of rebellion and adventure requires risk. Any adventurous activity ceases to be so when you remove any sense of risk. If you choose a life of faith today and going on into the future we imagine ahead of us, you will likely be subjected to attacks upon your choices, your virtues, your beliefs, and your identity. An increasingly atheistic culture will make the life of faith a great adventure and challenge. The life of faith becomes more rebellious by the day. Stanley Hauerwas writes, "This isn't the end. Its the beginning of God's experiment with your life. What God will make of you, we know not." It is no wonder Jesus taught that we ought to count the cost before following after him. It will be a life of adventure, risk, rebellion, and difficulty if you are actually up for it. Each year of ministry has come with its share of lessons learned. Currently, I am learning something with an impact for sustainable ministry into the future. Allow me to share this personal lesson in an address to other pastors and ministry leaders. Never neglect the reality that you just might not be sent to this congregation to change them, but that perhaps God is using this congregation to change you. Each leader has his inadequacies and weakness. Each ministry leader has her insecurities and doubts. Each pastor has his holes through which perfection leaks right out of grasp, and a congregation you engage with and truly shepherd will have an incredible knack for revealing those things. This is not an attack, nor is it an especially intentional action of the congregation. This is the way of congregation. It is the way of koinonia. It is the way of the Holy Spirit doing his work in the life of a pastor and ministry leader called to this very place. If you will allow, God will change you, ministry leader. He will do so with and through the people you thought you were here to fix, save, and change. How often do I truly worship God in spirit and truth? This is the worshiper that God desires, and I wonder on a daily or weekly Sunday basis if I truly worship God in the fashion He seeks from me. I may, if I am really on my game some days, worship God with my mind as I think about the things of God and this by no means is non-worship, but can I say I have engaged my spirit in moments of worship? Have I allowed the very heart and core of myself be engaged to and with my worship? Have I been able to lay aside distraction and noise for even an hour on Sunday or a few minutes throughout the week for worship so that my spirit might fully engage with God, who is spirit? Before I ever sit, stand, or arrive for worship have I prepared my heart, spirit, and will for worship? Can I pray beforehand with John Baillie, "God, grant me, I pray you, a clearer vision of your truth, a greater faith in your power, and a more confident assurance of your love." What then of worshiping in truth? Can I say I have worshiped God in truth? When I worship God on a daily or weekly Sunday basis, do I do so in alētheia (truth), more than a factuality, but in sincerity? More than fact-checking the words I say, but can I say my heart is sincere in its worship? God, may you seek and find a sincere worshiper in me. May I worship you in spirit and not only in mind or empty words. May I not wait until Sunday but know that today and with my whole life I am to give you honor and praise from my spirit to yours with sincerity and honest desire. I thought some more about the prodigal today. I have read and heard that story on countless occasions. As a child who longs for grace, unconditional Agape love, I cheer, with all Christians, for the prodigal and his father. We never grow tired of hearing this parable, and we cheer with delight in our hearts at the sight of the fathers unconditional embrace and the prodigal's humility. We imagine the prodigal's poverty and leap for joy at the prodigal's humble return. 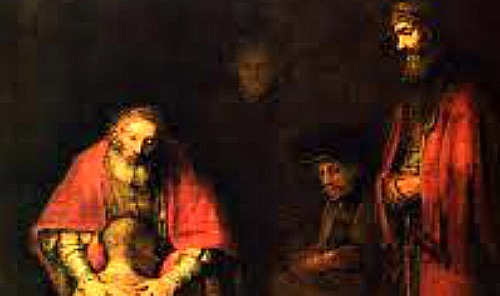 We see the prodigal lag his way home and watch the Father run to his battered and poor son. We go on the Father's joyful demand to get IPA and T-bone steaks with excellent joy for the prodigal's return. We read with great joy. We cheer for the prodigal. We live like the older brother. When the story is read and enjoyed, I walk past drunken homeless people on the streets. After the thrilling STORY is over, I get pissed off at the people around me. I weep for joy at the prodigal's return home to loving arms, and then I write a scathing status update to someone. I get all caught up in the greatest PLOT of grace and unconditional love ever uttered or written, and I have the hardest time accepting continued mistakes and life patterns in my own family members. I work hard to be the best Christian I can be for crying out loud, and here are all these people around me who aren't even trying. Here are all those people who do not understand that I am a Christian who wants to be all I can be, and they just go on like it doesn't make a difference. I believe in a God of unconditional love and grace and I loath the congregations who don't get it right. I am the prodigal here...not them! It is not just a parable. It is not just a fictional thriller to read and put back on the shelf until the next time. It is a story that serves as a humbling reflection of the reality we live every day. Like every parable, it is easy to associate myself with the good guy, the hero, but I can ALWAYS equally associate myself with the villian. My heart breaks when I realize I cheer for the prodigal and live like the older brother.